I find it mind-boggling that even today with always-on high-speed access and powerful computers, there is no simple way of transferring files from A to B. Simple, that is, for the non tech-savvy user or for the tech-savvy user who does not wish to spend a lot of time and effort on such a mundane activity! If I wish to access my office data from home, send video, PhotoShop, AutoCad, Photo albums or any heavy files to someone else - what should I do? This site is dedicated to these people. BeInSync (www.beinsync.com) is one software that can solve the problem of file transfer once and for all. The concept is simple: create a secured P2P network between two or more computers, and automatically synchronize files and folders among these computers. For example, if I wish to have my 'My Documents' folder available both at home and at the office, I simply add it to BeInSync and it is kept in sync between the two computers over the Internet. 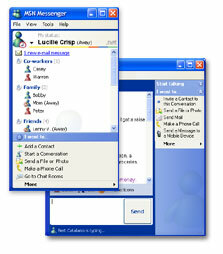 The alternative would have been using file transfer software such as FTP programs, using VPNs and so forth. I find WS_FTP (www.ipswitch.com) to be a good, solid file transfer program. I've had problems with CuteFTP and other applications, but this one seems more robust. Unlike applications such as BeInSync, it is not seamless and requires a working knowledge as to what an IP address is, etc. It is, however, recommended for administering Web sites and similar activities. Yes, all IM clients can transfer files between buddies. Assuming no firewall problems (MSN is good at fixing that) you can transfer virtually any size file. In reality, IM clients are not the most easy nor the most reliable way to transfer files. What's more, IM requires the other party to be present in order for the file to be transferred to or from that party. XDrive, Streamload and other applications offer you a sort of a "network drive" - storage space on the vendor's server. This enables you to easily upload files to the network drive in order to share, transfer or backup your files. Cons: you obviously need to pay for the storage space provided to you, and it's not cheap. Desktop streaming applications basically let you view your screen remotely. File transfer is typically also offered as a feature. PCAnywhere, GoToMyPC and many other applications are members of this category. 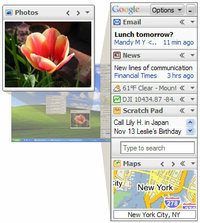 Personally, I opt for VNC (www.realvnc.com) since it's a free solution. OK, it may not be as easy to use as some of the paid solutions, but then again you can save $20 per month! Need to transfer large files? You can also do it the hard way, by physically carrying it with you. 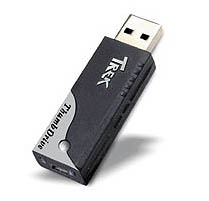 The most convenient way for doing that is USB thumb drives, available from practically all retailers. Naturally, you could also burn CDs, DVDs, use Zip drives, etc. I put my money on the less labour intensive solutions that are described in this site, though. If your requirements are limited to sharing or transferring photos, there are many nice applications available to you: Picasa's hello (www.hello.com, bought by Google), OurPictures (www.ourpictures.com), Pixpo (www.pixpo.com), ShareALot (www.sharealot.com), etc. For a very elaborate comparison table on file transfer application and methods, check out http://www.cnaffin.com/transfer.html. This site may be reached at http://www.largefilestransfer.com as well as through http://largefilestransfer.blogs.com. I have recently learned of several applications that enable you to send large files through them or "drop" them somewhere for someone else to pick up later. Limitations are 50MB for Dropload and 1GB for YouSendIt. Both rely, as I understand them, on keeping your files on their server until the file transfer is done. Not an ideal concept, in my opinion, but may be useful from time to time. All you need to know about remote access applications. I've been using BeInSync (http://www.beinsync.com) lately to keep my files in sync between the different computers I'm using. It was also extremely helpful when I got a new laptop and had to migrate the data from the old laptop to the new one. 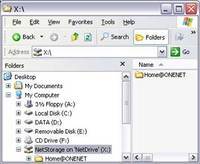 I recently came across MoveIt, which is more of a solution for the IT pros who wish to migrate PCs and transfer files between them. Check out SpearIt (http://www.spearit.com) for more information. SoftLink is targeting the larger organizations, enabling them to securely transfer up to terabytes of data. SoftLink cross-platform and comes in different forms (client, clientless). Read more about it on the company's Web site at www.softlink.com. Do you need to initiate file transfers on a regular basis? AutoFTP would do it for you. Check out www.primasoft.com/ftp_service.htm. It's a little pricy for the average user, though. iFolder (www.ifolder.com) is now an open source project. It is a server-client system which lets you share files across multiple computers and with other users. Benefits are backup, file sharing and remote access. In this respect, it bears some resemblence to BeInSync, only BeInSync (www.beinsync.com) does not require a server installation since it's all Peer-to-Peer. I have written in the past about file transfer Web services such as DropLoad, YouSendIt, etc. Today I found a new one called ForFile (www.forfile.com). Advantages seem to be encryption, email notification and quota. Haven't gotten around to testing it yet, though. Feel free to post your opinion. Pando (www.pando.com), a new product still in beta, offers a cool way of transferring any size file or folder using a P2P client. ToToExpress (not sure if I get the name yet...) is a web-based service that offers content producers such as musicians and photographers a way to collaborate, share and deliver their work. 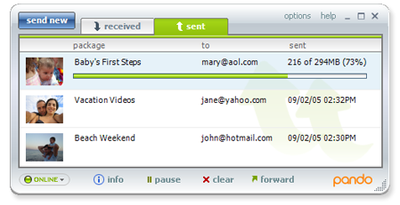 Using the product, one can send and receive large files. According to the comany's Web site, this saves a lot of time and money media and courier fees. Pricing ranges from $25 t0 $90 per month (dependent on the storage space allocated to you). Check out www.totoexpress.com.